Your garage is one of the main areas targeting during a break-in, so it is up to us to make sure you’ve for the best locks and protection to secure your garage. We have some fantastic selection of garage door lockouts, garage handles and safe garage door defenders which can all be easily fit and ready to use. Continue reading to find out which one suits you best. Safe garage door push button control is a type of lock where you should push the button to open the door. It can be used with any garage door operator, supplied with 2 fixing screws. Its Backplate diameter is 42mm, and screw centers horizontal is 25mm. This garage door is said to be a safe lock, as you can fit this lock in a place where only you or your family would know. So only the push of this button can unlock the door, make a secret space for this to be fit, so it’s only you and your trusted mates who knows its location. It is also very cheap and budget friendly. Designed to work with Apple Homekit using bluetooh Smart technology so you will have a high tech door lock on your garage. It has a built in alarm technology that can sense intruders and door attacks as well, which holds up to 30 access codes at the time. Can be easily set up and programmed with the Application provided. Along with that comes a life time warranty for mechanical and finish warranty along with another 3 years electronics warranty. 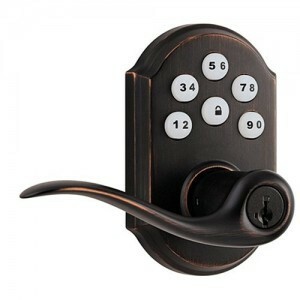 If you are a fan of modern typed door locks which also has style in it, then this lock is the one for you. It features a Smart key, re-key technology which means you can re-key the lock yourself in seconds in three easy and simple steps. The lever can be operated by the key hole outside, or if you are inside then with the electronic keypad and thumb turn inside. It also has an adjustable latch to fit all the standard door preparations. It requires batteries which are not included in the packaging. This is a very fine door lock with style, and security in one. 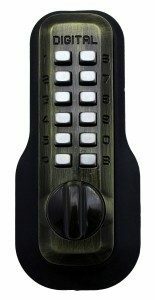 This is a mechanical keyless deadbolt with double combination that is an adjustable deadbolt. The back piece is attached to the front piece as you purchase it. You have to disassemble and reassemble this onto your garage door as per your requirements. 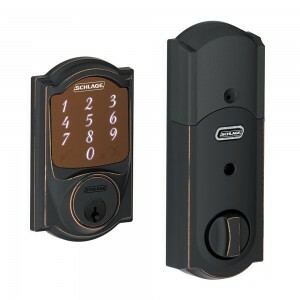 It comes along with a programmable code and mechanical keyless push button lock. 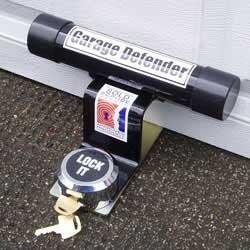 It is made out of aluminum stainless steel so that it can keep unwanted visitors away from your garage which leaves you feeling much more secured than before. This is a solid secure approved product as it comes along with steel hardened padlock and a bar unit that locks onto a solid steel base with the supplied padlock. It has a simple ground fitting in the front garage door with expandable security bolts that are included in the package. It has a powder coated finish and it can also be installed within an hour or less with the manual that is provided. It also has high security product features that eliminates cutting and sawing risks. This is presented to us as a keyless lock which is ideal for garages, office doors and backdoors and any other place which requires multiple user codes. It can be programmed to have 10 independent users. Changing the cods takes less than 30 seconds. You no longer have to carry numerous amount of keys with you, as you can give the codes to your friend, family or employees or even your guests. However the package includes two emergency override keys in case you forget the code. Signature Garage Doors & Gate Repair – They are a family owned and operated company. They are 5 star rated and are known to be very well experienced in this field. They are also to be the best Garage Door Mission Hills Company in the area. Sears Garage Doors – They are another Garage Door Los Angeles Company who serves Los Angeles as well as its surrounding areas. They offer a full complement garage door service, including garage door and opener repairs, door installations and more. They are also to be reasonable and affordable. Given a rating of 4.6 stars, they are worth the visit in case you are facing trouble with your Garage Door.